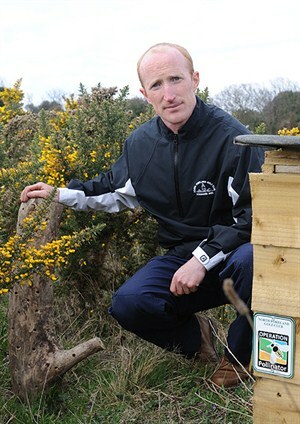 Dan McGrath MG, Course Manager atNorth Foreland Golf Club - and winner of the Operation Pollinator Award 2013 - offers his practical advice on what has worked for them in establishing a successful and incredibly valuable ecological asset for wildlife and the club. What site did you choose for the Operation Pollinator areas, and why? The site had previously been unmanaged for 30+yrs, with extensive ground ivy to knee depth that had taken over the chalk grassland rough. Site selection was due to it being largely out of play with limited foot traffic. At the same time it was close enough to have visual value to the golfers and general public. We have selected two sites with different aspects, to determine which conditions favour the target species and our longer term goals. How did you choose the seed mixture? We studied available wildflower mixes with all the main seed breeders, and then sought to match that with what is native to our chalk grassland cliff-top site. This year we have gone for a straight wildflower mix with no grasses, and made to our own specifications of 15% Greater Knapweed; 15% Wild Carrot; 20% Small Scabious; 20% Ox Eye Daisy and 30% Wild Mignonette. What methods have been used when seeding? In Year One we broadcast the seed with sand mixed in as a carrier by means of a cyclone spreader. This was seeded onto the area that had been scarified down to near bare earth and then the surface pricked with an aerator followed by a brush. This year, however, we have gone down the route of sowing the seed ourselves in plug trays. Once germinated and matured to a satisfactory level we have then transplanted the plugs to the site. Broadcasting was very hit and miss on this exceptionally dry site, so the plug method was employed to aid quick establishment and give the plant a head start in respect to competition within the existing composition. Initially I was looking for the plugs to just survive in their new environment for the first year. Then, with over 1000 plugs planted, in Year Two and Three, we hope to see the impact from a flowering aspect. The scarification programme has also greatly increased the percentage of Kidney Vetch and ladies bedstraw that was already in the natural seed bank, but that had laid dormant for years due to being smothered by the ivy and scrub. The rough has been alive with flying insects, moths, butterflies, grasshoppers etc, especially given the high intensity sunlight hours experienced this summer. The selected sites have certainly seen their environmental and ecological value increase no end. 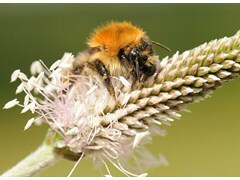 Bee activity within the two Bee Hotels has been scarce at present but numbers in the area seem to be increasing slowly. It will take time, but we have encouraging signs and interest from members and general public year on year. What is your the annual maintenance programme, including any allocated costs/resources? The areas are scarified with a Rytec in October with all cuttings taken away to be composted. This is helping in removing nutrients. The hope is to eventually spread these cuttings from wildflower areas over stripped areas and brush them into the lightly tilled soil to spread seed. A light topping of the areas may also be deemed necessary in Feb, depending on winter growth. Man hours for cutting and collecting would be in the region of eight hours for just the Operation Pollinator areas, with surrounding chalk grassland rough taking another five to six days for one man. A 1kg bag of own specified mixture cost £155 and to date has provided me over 1000 plugs with still a 1/3 of a bag left - approx. 1600-1800 plugs. The plugs have been grown in small propagators by Maintenance Office which we purchased for £60 from Amazon for grass experiments and trials. They have been established with five to 10 minutes watering every other day during establishment period, and then two guys spent a day to plant 600 plugs. How have you communicated your project within your club? I produce Quarterly Course Managers reports to committees, board of directors and then this goes to the membership newsletter as a link. Permanent signage has been erected on car park and clubhouse entrances and along the coastal pathway which runs along our boundary. Articles have been issued to the local press and the OP logo has been used to make up drinks mats for the clubhouse. Everything helps and word has spread far faster than I had ever imagined within the membership and locally. How have you communicated your project to the local community and general public? Signs along the Thanet Coastal Pathway and articles in the local Thanet Gazette newspaper have highlighted how we are working with nature while producing an enjoyable golfing experience. A flora & fauna sign of what we are doing on site is located at the entrance to the clubhouse and Par 3 course. This catches a lot of visitors on route from the visitors' car park. Numbers of non-golfers are increasing daily on the site, with functions and the new addition of wedding ceremonies and receptions now being licensed on the site - this has been great for marketing. Using the logo as a footer to emails and letters etc. has probably been one of the best ways of getting people's attention on a daily basis as well. Do you have any future plans regarding PR/communication of your project? A yearly article in the local press to remind people would be certainly beneficial and achievable. This accompanied by continuing to spread the word within the turf industry and my peers can only help to get people on board and paint a better picture of golf courses and their value to flora and fauna. What has been the main benefit you've seen of implementing the programme? Probably the biggest thing has been the sense of pride and enjoyment that the team, members and visitors have when playing or working in the environment. It has also given greater diversity; not only to the site, but to the daily/seasonal jobs we carry out. 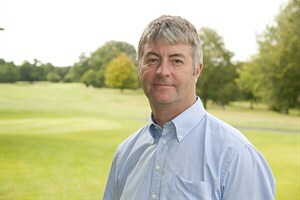 The marketing for the greenstaff, course and business as a whole has been immense and will hopefully continue to grow. It is a new skill within our armoury and one that can only improve year on year through trialling out different methods. It is obvious from Dan's summary here that this is a long term project with areas chosen to inform the difficulties and likely levels of success. It is important that the site(s) chosen are sufficiently out of play but close enough to allow golfers and the public to appreciate the colour and interest provided several of the champion clubs undertaking the project are placing their areas adjacent to public footpaths and providing signage to inform ramblers and the wider public of the aim of the work. The seed chosen by Dan is his take on what he knows will grow well in his circumstances; it is important that consideration is given to what grows well in your own area and choose seed accordingly. Plugs are being successfully used at North Foreland, but in most cases seed should suffice - as long as the ground is adequately prepared and assuming conducive growing conditions. With spring seeding, I always think it best, as a belt and braces type approach, to hold back some seed or at least retain some budget for additional seed for the autumn. This is vital to ensure success, as all the members will be anxiously awaiting a response. Some clubs are mixing a few summer annuals in the mix just to give an immediate effect This is okay as long as they are kept to no more than 2 gm2 otherwise they may exclude the growth of the perennials.